Neighbourhood Restaurant offering the best in season produce. Brilliant as always. Fabulous food and really lovely staff. A lovely late Sunday lunch. Friendly staff, delicious food. Will definitely be back! We pre ordered and it took over 90 minutes for the first course to arrive. We got there as planned for 8 pm and started eating at 9:40. Two of our party had to leave in 15 minutes due to child care arrangements. 90+ minutes is a very very long wait if we had ordered on the night. However we pre ordered, it should have taken 20 minutes for our food to arrive from the booking time (the time we arrived). We will eat here again as a couple as the food was excellent when it arrived. However we will not invite friends or celebrate as a group here again. Very enjoyable experience. Will certainly return when I’m in the area. Fine dining in a chilled atmosphere where dogs are welcome, so perfect environment as far as I’m concerned! Food is incredibly tasty with complimentary nibbles (always appreciated) and veggie and vegan options. As with all fine dining it’s pricey considering what you get on the plate so sides are recommended if you’re hungry. All sides also delicious. This is fast becoming a local favourite. A delicious Sunday Roast. Service was excellent and food was fabulous. I will definitely be coming again. Thank you. The roast really is amazing. If you're considering trying to won't be disappointed. Brilliant brilliant roast- possibly the best I’ve had in south London?! Loved how there was extras available if we needed them! Great service, drinks came a little slow but it really didn’t matter! Have already recommended you to my neighbours and friends. Just a shame we didn’t discover it earlier! Sunday roast was superb and service excellent (especially from the lady in the French beret. Great food and attention to detail. Only thing I’d say is a server stroked a dog that was in the restaraunt and continued with their work without going and washing their hands. Fabulous Sunday roast on my father’s birthday. Very delicious, friendly and helpful staff in a gorgeous setting. 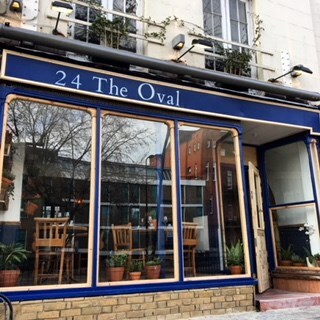 We are so lucky to have 24 The Oval on our doorstep, but if it wasn't local we'd still be travelling for the stunning food, delightful service and all-round generosity! Great food, great service. Thanks for an enjoyable experience. Perfect Sunday Roast. Served impeccably - loved all the extra surprises and trimmings served along side.